+Denis McCarthy 's Beneath the Fallen Tower just released on RPGNow. 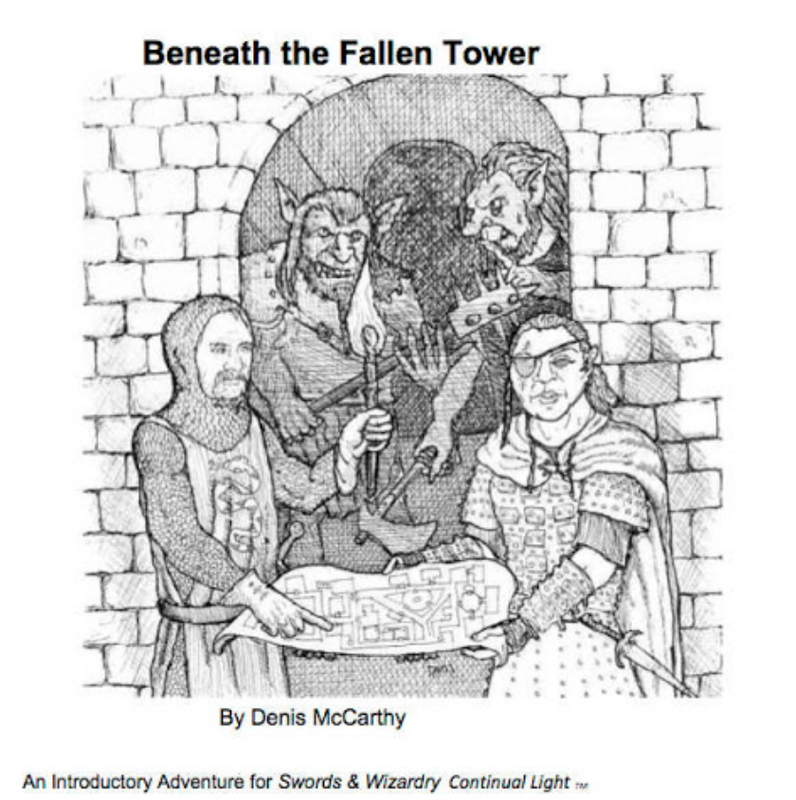 Rach and I played in Denis' SWCL session last Saturday and got to experience Beneath the Fallen Tower first hand. We, as well as everyone at the table, had a blast. Although we achieved our goal in a single 3 hour session, we were treating it as convention play and were much more focused on the goal (not giving into distractions) than I suspect my weekly group would have been. Mu guess is there's about 2 sessions of play here for most groups as well as the nugget of a setting. It makes for a really nice package to kick a campaign off with. Fifty years ago, a magician known as Melchior the Despoiler, rumored to be consorting with dark forces near the town of Southfork was investigated by a troop of militia and a priest... all of who returned from his tower as undead attempting to slay their own families. They were defeated, and after a petition for aid, the Duke lent the village his trebuchet and his men leveled the mage's tower. Shortly before this assault was mounted, Melchior’s apprentice Xander escaped with a few books, a wand and a magical blade. There's an affiliate link above. Affiliate links keep the taps flowing and the lights on here at The Tavern. We thank you. I feel like the most exciting part of the adventure has been relegated to history. If I were playing, I'd rather finish taking out Melchior just after his tower fell.